I finished off a bottle of Blanton’s the other night, which means I can now go shopping for a different letter. 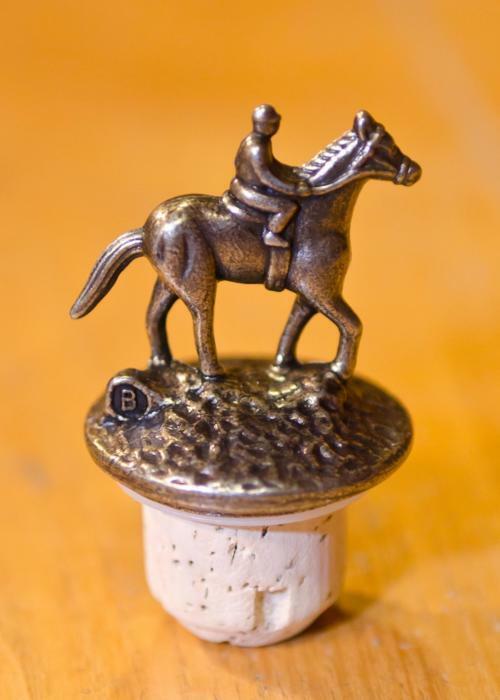 In case you aren’t familiar with this stroke of marketing genius, each Blanton’s stopper is stamped with a tiny letter (see the “B” up there in the photo?) near the hoof of a racehorse. Collect all eight to spell out “B-L-A-N-T-O-N-S.” The legs of each horse are in a different position as well, which together represent the stride of a horse thundering down the stretch in the Kentucky Derby. My collection of stoppers is pretty small. I love Blanton’s, but when you’re a bourbon blogger, there are so many brands to try that it takes a while to empty a bottle. And when I am in the market, it’s sometimes difficult to find the letters I need. I wondered if some letters are rarer than others – like in Scrabble. So I asked Amy Preske, public relations and events manager at Buffalo Trace Distillery in Frankfort, where Blanton’s is made. You can purchase individual stoppers in the Buffalo Trace gift shop for $2.75 each or buy a complete set on a barrel stave (below) for $85. But Amy says most Blanton’s fans she’s encountered consider that cheating. My buddy and I purchased 2 cases recently. One of the Jockeys with an ‘A’ letter has a headless jockey?? Is this just an anomaly? It’s like a mis stamped coin? I hope it’s worth something! What a great bit of fun to have with a great whiskey! Unfortunately, I think that’s probably a jockey who suffered a fatal injury during shipping. Good try, though! The important thing is to enjoy what’s in the bottle. I have a couple of older bottles that are from 94 and the stoppers don’t have any letters. Got any idea whether they are worth anything? Blanton is fine and smooth, but does anyone know what kinda metal is the stoppers made of. Happy drinking! !!!! Is there an N’ or are only an N? I have 5 N’s I would like to trade for anything other than B or L.
Hi Peter, I can trade you a B for N? I need the first N to complete my second set. I have several others to trade S,O, L, 2nd -N. If you have the first N, let me know we’ll trade. And oh yeah….I drink a lot of Blanton’s I’ve tried a lot of bourbon and so far this is my favorite. Haven’t had a chance to try Pappy yet. It has to be the second N’ as I already have the first N.
I have the complete set …do I trade therm in for something? I was told that if I collected all the letters, Blantons would send you a display. Someone told me the two Ns were N. and N: not N and N’. Which is it?